Surrounded by water on three sides with an inland maze of lakes, rivers, streams, and springs, Florida has a fishing culture unlike any other state and with it comes an abundance of delectable recipes. 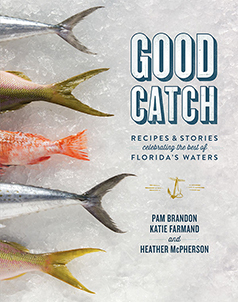 Following their award-winning Field to Feast: Recipes Celebrating Florida Farmers, Chefs, and Artisans, authors Pam Brandon, Katie Farmand, and Heather McPherson take readers on a journey to savor the bounty of the state’s countless waterways and bring these distinctly Floridian recipes from the sea to your table. In Good Catch, the authors befriend the fishermen, the frog giggers, and the shrimpers whose pride in their hard work is near tangible and whose joy comes from spending time so close to nature. Their stories, evoking a way of life that has endured for generations, will transform you—if you have not been already—into a champion of local fishermen. From amberjack to snook, from roasted Apalachicola oysters to steamed spiny lobster from the Florida Keys—plus, all the accompanying starters, salads, and sides—Good Catch brings Sunshine State flavor into your kitchen.